The Stack Blog takes an exclusive look at Andre Ethier's Shed/Man Cave. It's the kind of place we all dream about. 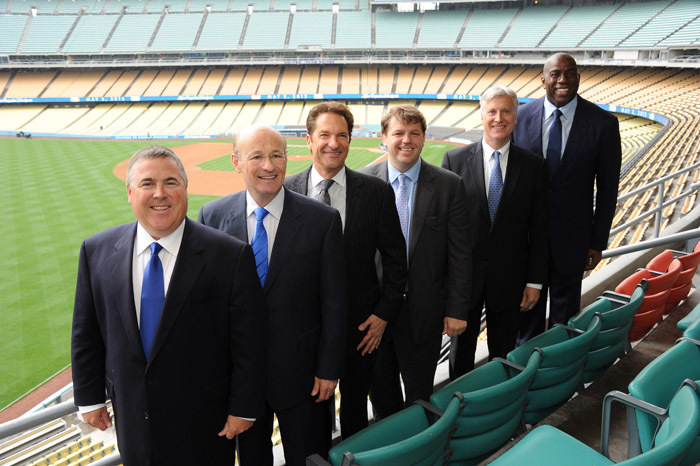 Above is the entourage of new Dodger principals, pic via Jon SooHoo's Blog. Before you do anything be sure to check on Jon SooHoo's blog post featuring a ton of photos taken during yesterdays press conference. And when I say a ton I mean a ton! Secondly, in a move that is somewhat reminiscent of Arte Moreno when he purchased the Angels, Magic Johnson announces that they will be lowering the price of parking by 33%. The $15 fee will now drop to $10 per car. As you will recall, one of the first things Moreno did as the Angels owner was to lower the price of beer. Seeing that this exact move is probably not wise considering last seasons drunken violence issues, the new owners decide to take a little swipe at McCourt by subtlety conveying that they are not like him. These guys are not parking lot attendants. 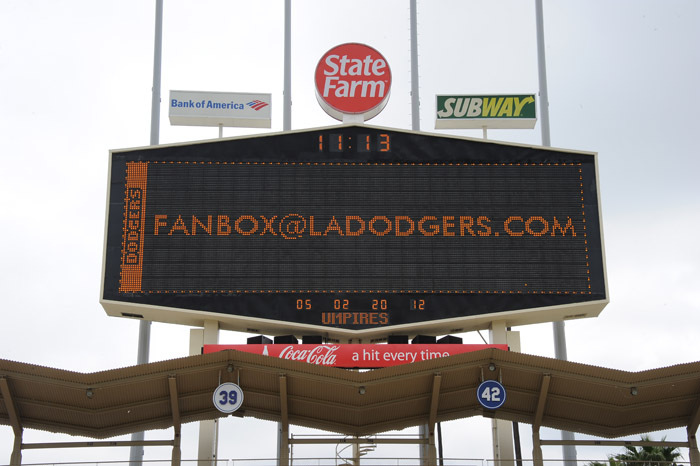 Another special announcement is the creation of a direct Dodger suggestion mailbox. Do you have any ideas, suggestions and comments for the new owners? Well, they want to know what you have to say, and have put together an email just for fans to voice their thoughts. 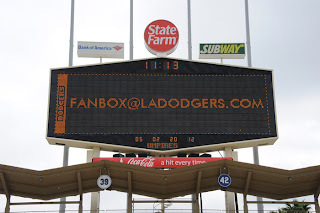 Write to them at fanbox@ladodgers.com. Jon Weisman at Dodger Thoughts has a nice recap of the entire conference. Kevin Baxter at the LA Times writes about the new Dodgers President, Stan Kasten. He is now the brains of the Dodgers. Meet Peter Gruber, Chairman of Mandalay Entertainment Group, via Roger Vincent of the LA Times. I would consider him the entertainer of the group. He knows how to get people in the seats, and can build the grounds into something fans want to visit all year round. 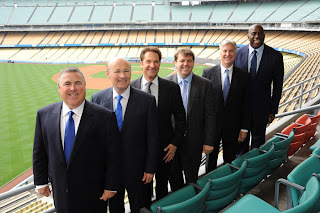 Fox Sports Radio AM570 interviews: Mark Walter, Stan Kasten and Magic Johnson. Gary Klein at the LA Times writes about Magic. His stake in the team is at about $50Mil or 3% to 4%. I think it's fair to say he is the face of the team, or in "Ocean Eleven" terms he's the Ella Fitzgerald. "You have always built from the ground up ... but with all the money invested (in the purchase of the Dodgers), would you expect, say in midseason, if a team is out of a pennant race, and we're in a pennant race, that you would go after a potential free agent in David Wright and others? Would the Dodgers spend in midyear on established talent?" Peter Gruber just visited the Fox Business News folks. Here are this weekends autograph opportunities throughout the Southland. As always, be sure to check the Blue Heaven Calendar for other events (a link can always be found on the tab at the top of this page, just left of center), and always confirm with the establishment. Everything is subject to change. There doesn't appear to be much going on this weekend when it comes to autograph opportunities. On the other hand, the event I am aware of would probably overshadow any other event in Southern California. So, why bother competing, right? Who could be that large of a draw? Well, the Dodgers sexiest fan, Alyssa Milano, will be signing in Culver City. More information can be found here. From my understanding, you must purchase something from her clothing line, called Touch, at a store called Fanzz in the mall. Just as a reminder, I wanted to point to two exhibits worth taking a look at. 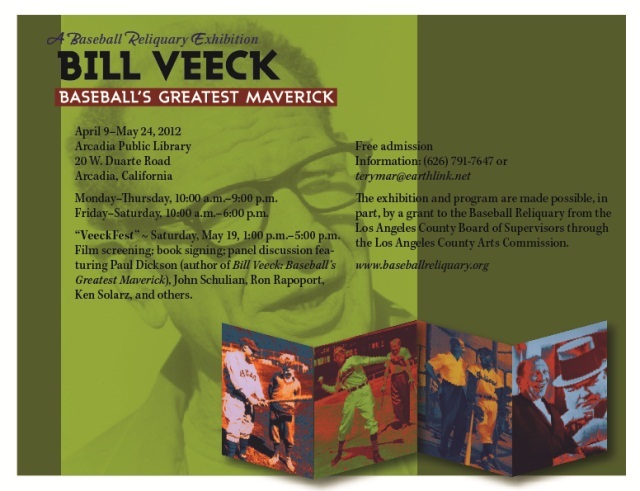 The Baseball Reliquary presents "Bill Veeck: Baseball's Greatest Maverick" at the Arcadia Public Library on Duarte Road. Details can be found here. See the flyer below. Click the pic to embiggen. And the Walls Came Tumblin’ Down: Pioneers of Baseball’s Integration, an exhibition which utilizes photographs, artworks, artifacts, and documents to examine some of the figures who played pivotal roles in integrating baseball, including Jackie Robinson, Larry Doby, Satchel Paige, Branch Rickey, Bill Veeck, Lester Rodney, and Emmett Ashford. South Pasadena Public Library, 1100 Oxley St., South Pasadena, CA. Free admission. Library hours are Monday-Wednesday, 11:00 am-9:00 pm; Thursday-Friday, 10:00 am-6:00 pm; Saturday, 10:00 am-5:00 pm; Sunday, 1:00-5:00 pm. Further information, phone (626) 791-7647; for directions, phone (626) 403-7340 during library hours. Go here for some details. 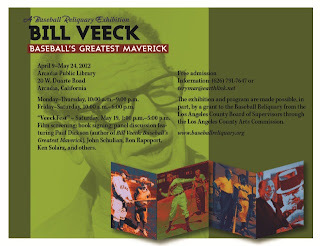 Roberto at Vin Scully is My Homeboy posted some information on the exhibit here. Vin Scully didn't always broadcast alone in the Dodgers press box. At one time he had a able sidekick who was there to add some flavor to the story being woven. That other half was also originally cast from the borough of Brooklyn and came out west with Vin to broadcast Dodger games. From 1956 to 1987 Jerry Doggett was the straight man to Scully's poetic verse. They were like a comedic duo as one man played second banana to the other. It was a joy to listen to, and I have to admit that I miss the repartee that existed back then. 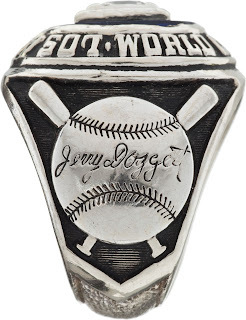 Anyway, I bring up Jerry Doggett because of a collection I ran into that is being sold through Heritage Auctions. Right now, in what looks like Doggett's entire Baseball collection, are some of his Dodger artifacts. 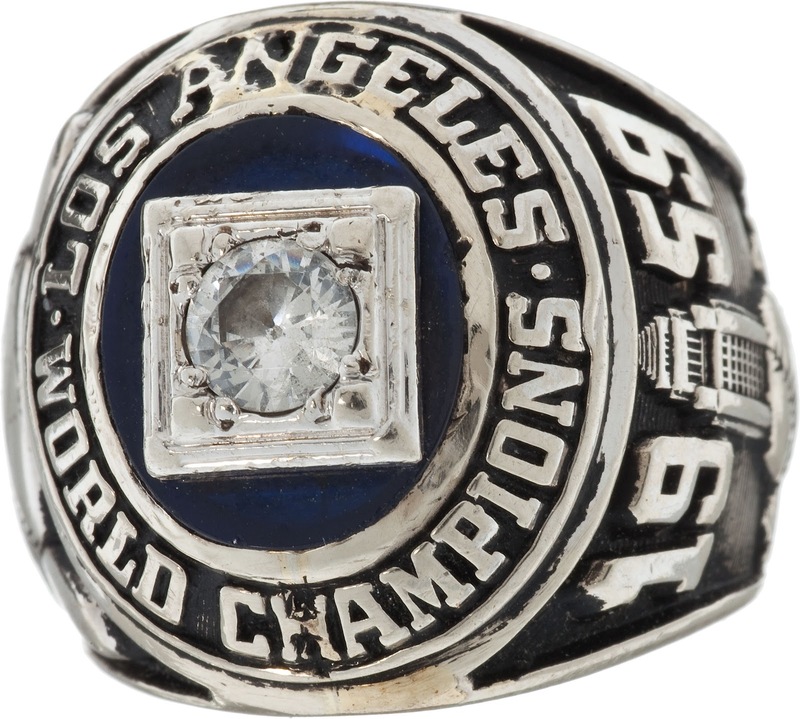 Below, I feature just a couple of items (his 1959 WS ring and 1981 WS trophy) but there is so much more available. 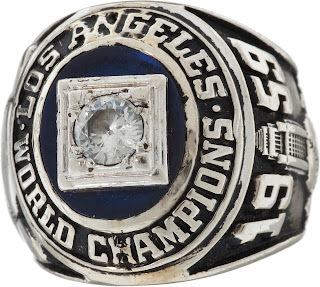 Here is a list: WS Rings (1959, 1963, 1981); NL Championship Rings (1974, 1977, 1978); and All Star Ring (1980). It closes in just a few days so if you're in the market I suggest you get cracking. 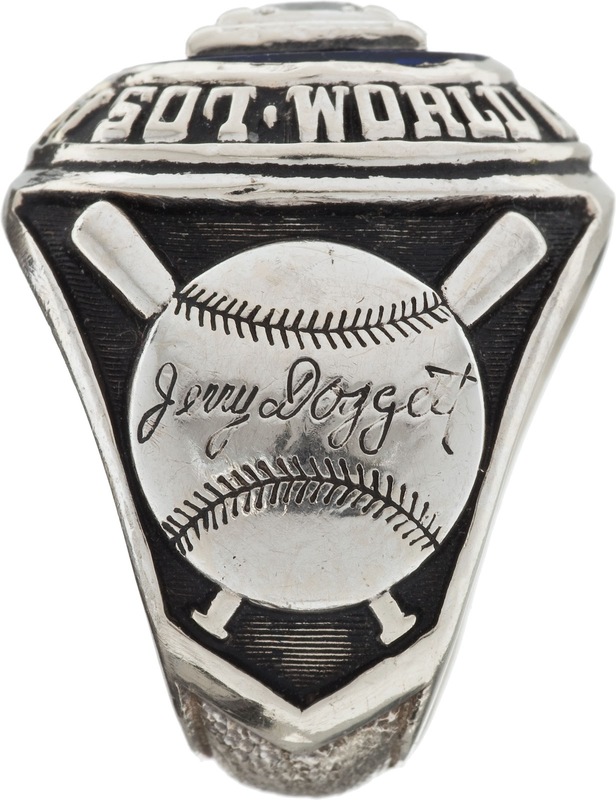 Here is a view of his 1959 World Series Ring. 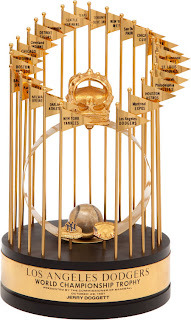 Here is Jerry's 1981 World Series Trophy. Just awesome. 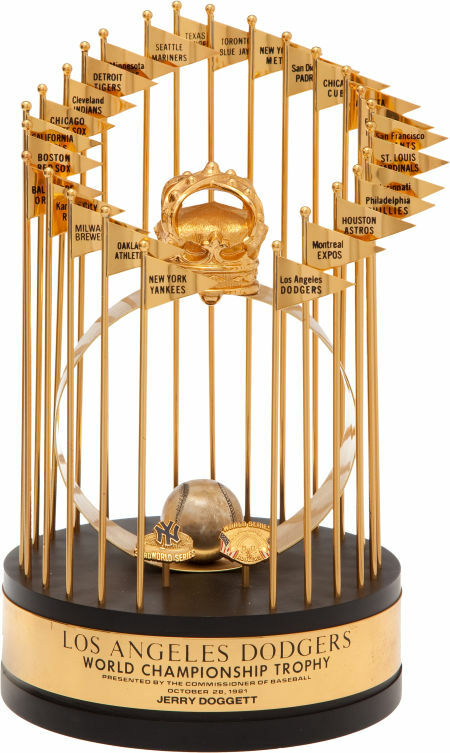 Unfortunately, Jerry had retired from the Dodgers in 1987, so it appears he did not receive a 1988 trophy.